Thank you for visiting! This cause is very dear to our teams, and we appreciate all the support we can get! 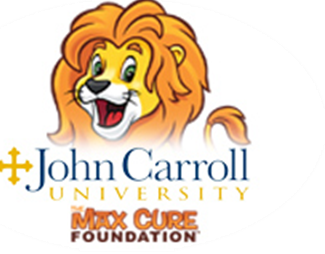 At John Carroll University our Student Athletic Advisory Comittee has started a fundraising tradition called "Streaks To The Max," where each year our teams put on various fundraising events to raise money for the Max Cure Foundation. Last year the lacrosse teams alone raised over $1,000, and we're hoping to top that this year! This year's events will take place before, during, and after D3 week, featuring various programs hosting events which showcase their respective sports. These will be stand alone or joint activities, sometimes incorporated with varsity contests. All proceeds will go directly to the MaxCure Foundation and its Roars Beyond Barriers program. The three-fold mission of The Max Cure Foundation includes funding research for pediatric cancer treatment development, efforts to discover less toxic treatments for children with cancer, financially assisting low-income and military families with children battling cancer, and vigorous advocacy efforts pursuing legislative and regulatory changes benefitting children with cancer while also raising awareness for the needs of those fighting pediatric cancers.